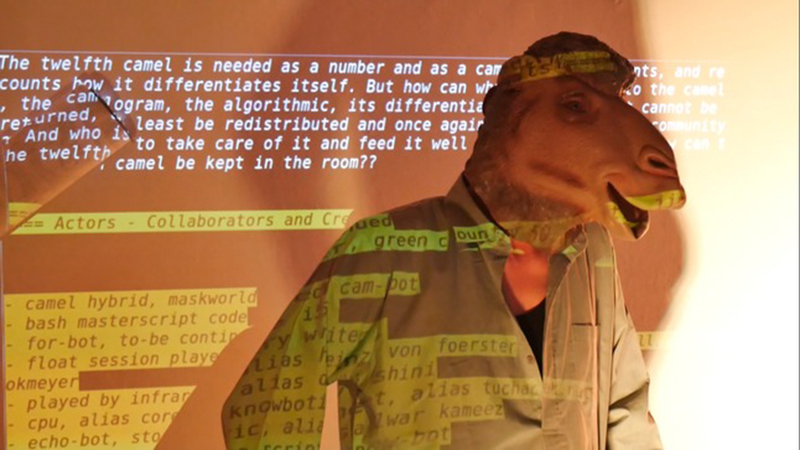 The work "reclaim the 12th camel" circles around questions of codetermination, participation and felt powerlessness from the increasing algorithmization of the realities of our lives. It attempts to oppose to the changed reality of conditions of division and participation in the context of digital-algorithmic environments a figure following a scripted metamorphosis and an algorithmic-corporeal hybridization. The key term of metamorphosis intends a time period in which through a scripted narrative, several mixed forms of text, code, music and performative corporeal elements are performed in several scenes. The different text-body relations play a role, ranging from writing text to speaking, all the way to scripted speech and algorithmically "tracked" writing and playing music through the body. At the center of this metamorphosis lies a special animal, the 12th camel, which is at once text, image, program and narrative. This camel is borrowed from a short story by Heinz von Förster (in: Lynn Segal, Das 18. Kamel oder die Welt als Erfindung. Zum Konstruktivismus Heinz von Foersters). 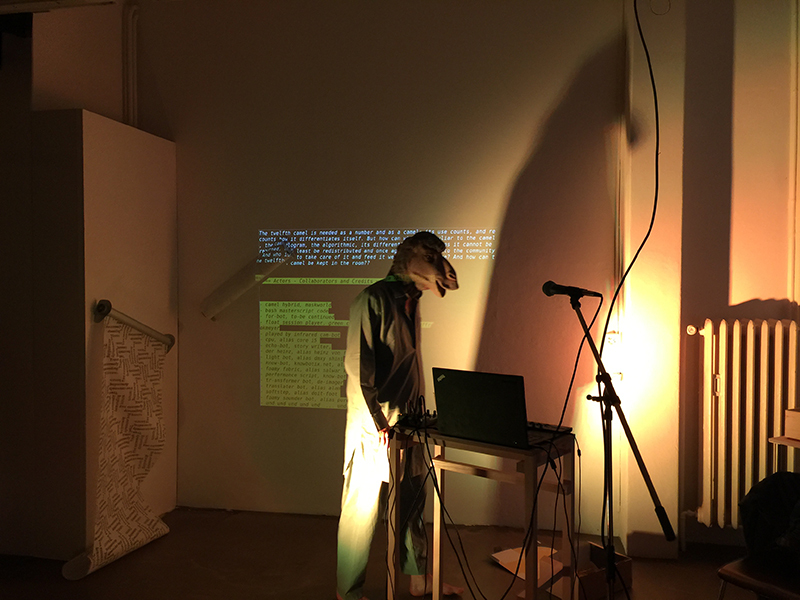 In the live performance the artist himself turns into a programmed animal, the camel, by fulfilling the transformative act through instructions and disguise. In the installative version the offer of metamorphosis is addressed to the visitors. A countdown will announce a new performance at intervals, which however can be fulfilled by the visitors themselves. A camera recognizes visitors and switches from bot mode to visitor mode. Through their active participation, the visitors become part of the installation. Alexander Tuchaček works with sound, natural language, computer codes and text. A key characteristic of his work may be considered that it interrogates various actions and the consequences that arise from them. Frequently, he will produce spaces of possibility, ambiguous configurations of human interactions characterized by an exaggerated referential system.